The above photo is a green manure plant called Phacelia, it is one example of a variety of plants used in organic growing to achieve a number of aims in the vegetable and flower garden. Other examples of decorative green manure plants are Red, White or Crimson Clovers, Sweet Lupin, and Vetch, which can be ordered from Fruit Hill Farm, Bantry, County Cork. 1. Green manure plants can be dug into the ground when they are young, in order to decompose and release nutrients into the soil to increase soil fertility. 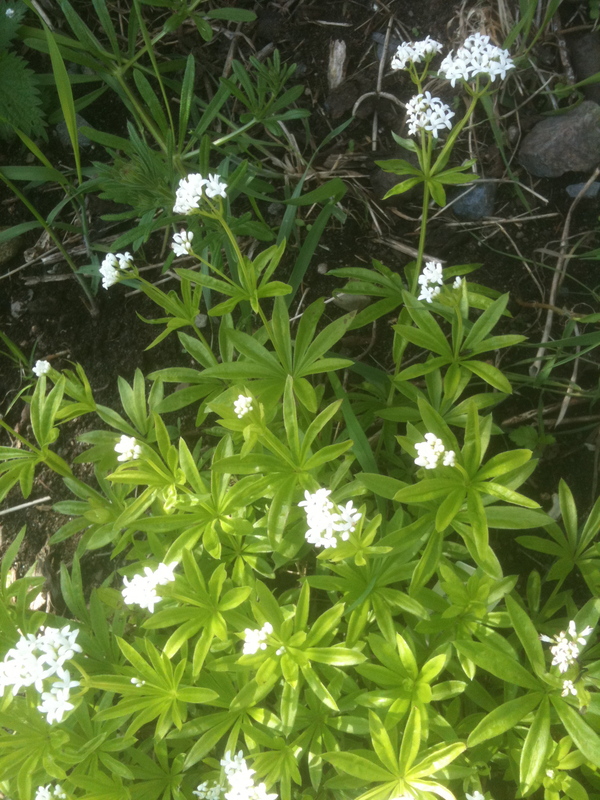 Clovers, lupins and vetches are particularly useful to increase soil fertility, as they absorb nitrogen from the atmosphere and release this important soil nutrient into the soil to be taken up by the roots of other plants (i.e. brassicas – cabbage, broccoli, kale, etc.). 2. 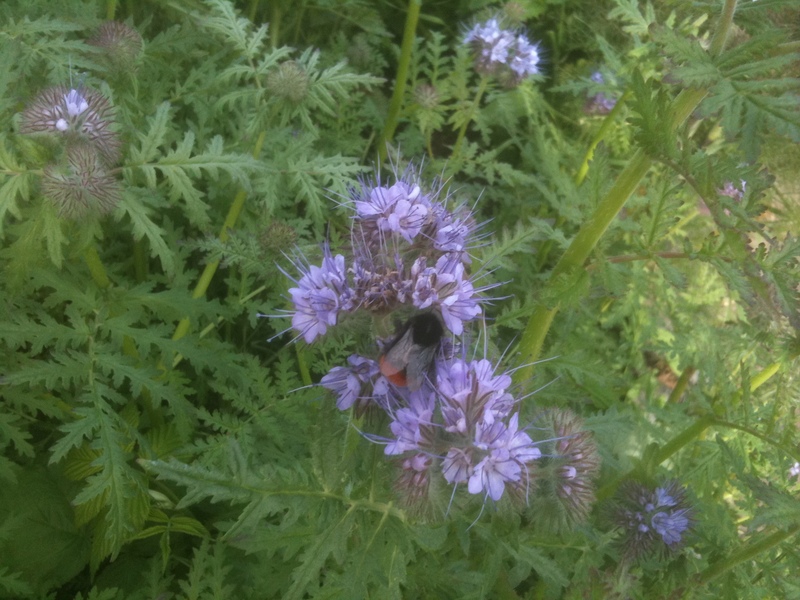 The flowers of green manure plants attract bees to the garden. 3. The dense growth of green manure plants can support plants around them (for example broad beans), or provide ground cover to suppress weeds. Green manures germinate and grow quickly, they can help to smother young weed seedlings. 4. 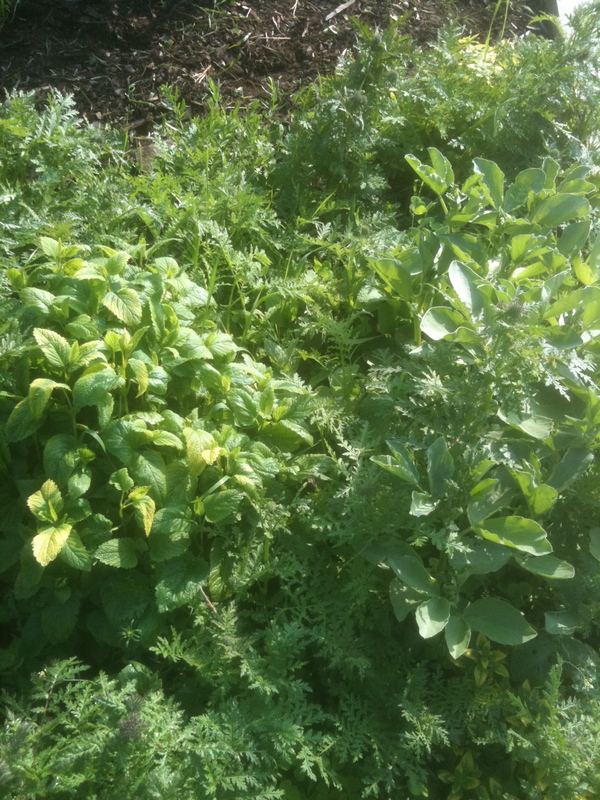 Growing green manure plants within bare areas of the garden also helps to retain moisture and prevents the loss of nutrients being taken away from the top layer of the soil by wind, and rain. 5. 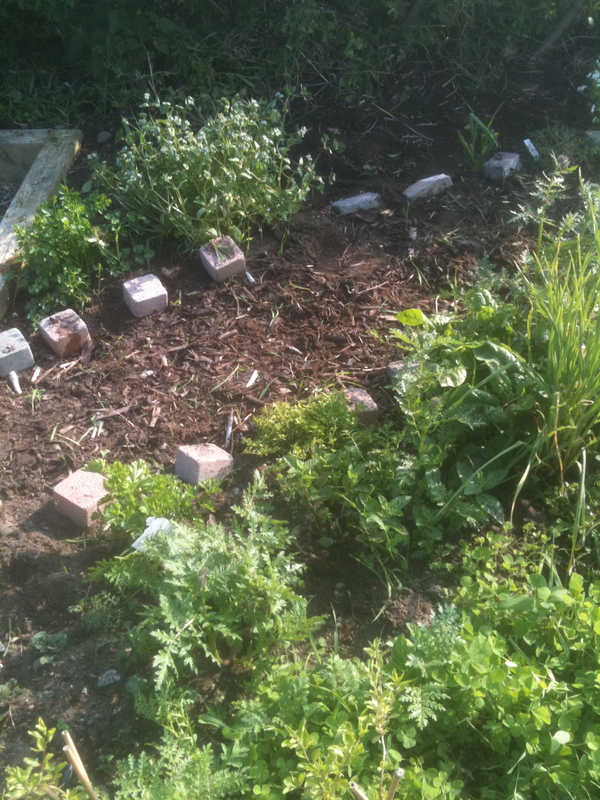 Green manure seeds are sown like grass seeds, spread upon the top of the soil. They can be sown in the autumn, summer and spring within entirely empty planting beds, or in-between existing vegetables, herbs and flowers. 6. The roots of green manure plants improve soil structure and stop soil compaction, and their green growth can attract beneficial insects. Some flying pests can be confused if the outlines of their food plant are disguised by green manures interplanted between plants. Liquid Feeds or Compost Teas, are made from nettles, seaweed, comfrey, borage and manure ingredients mixed with water and then diluted in a watering can with more water and applied directly upon plants. Plants that are not thriving, yellow, infested with insects, not fruiting, newly transplanted, plants in containers, etc., can use this extra dose of nutrients which their roots take up from the soil. Ideally a large bucket or bin, with a lid, can be used to make liquid feeds. In the bucket or bin, place a good layer of nettles, borage, seaweed, or manure at the bottom of your chosen container and then fill with water. Let it decompose for a week or two, and then dip your watering can into the container with the liquid feed, topping up the can with water, before watering your plants. Seaweed Liquid Feed contains growth hormones and can be used to germinate seedlings and to encourage roots on newly transplanted vegetables, herbs and flowers. 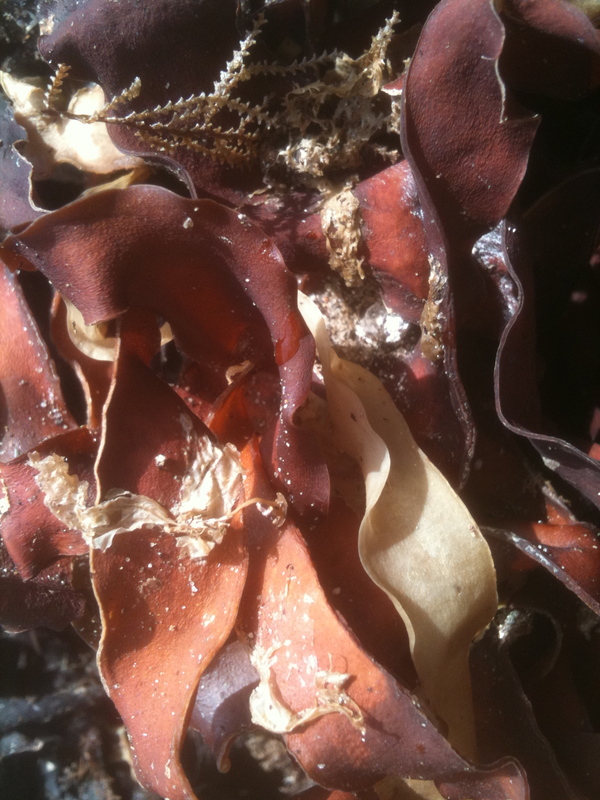 The smell of seaweed liquid feed can be a deterrent to pests, i.e. aphids. To treat a pest infested plant, spray it directly on to infected plant areas. Nettle Liquid Feed is high in nitrogen and can help plants depleted of nutrients from the soil becoming yellow, with poor growth. Use for nitrogen hungry crops, i.e. cabbages, spinach, broccoli, swiss chard, etc. Manure Liquid Feed is also high in nitrogen and could be used as a supplement for soft fruit bushes, fruit trees, courgettes, and pumpkins which require high soil fertility. Borage Liquid Feed is high in nitrogen and potassium and can also be used for ailing plants and vegetables. 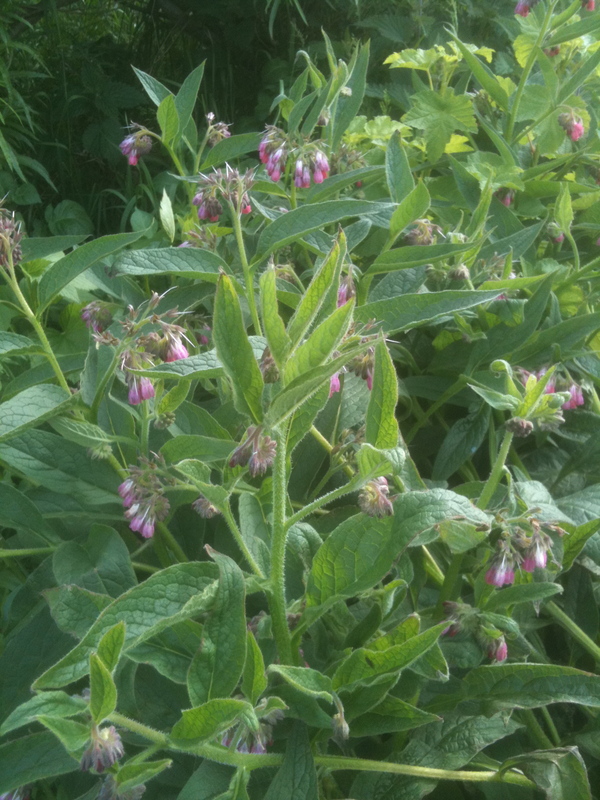 Comfrey Liquid Feed (The above is a picture of comfrey in bloom). Comfrey has a long tap root, which essentially mines nutrients from the soil and these nutrients are released through the leaves when soaked in water. A good feed for fruiting plants (i.e. tomatoes), and soft fruit as it has a high potassium content. Layers of organic mulches are essentially layers of compost applied as top dressings to vegetable and flower beds. 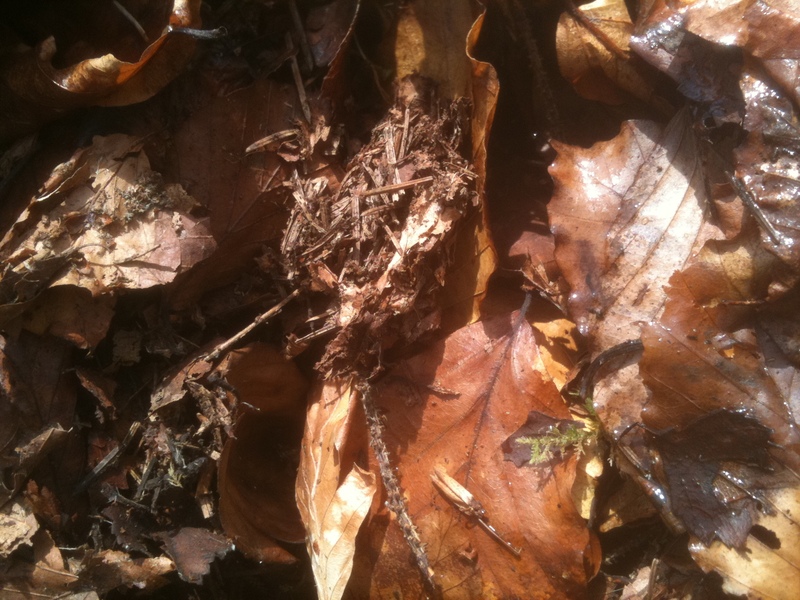 Examples of organic mulches are seaweed (pictured above), leaf compost (pictured above), straw, grass clippings, old hay, pine needles, and the contents of your compost bin. Layer these mulches thickly around established plants and particularly newly planted hedges, trees, soft fruits, pumpkins, courgettes, forest gardens with descending layers of fruiting trees, edible shrubs, herbs and vegetables. Organic mulches increase soil fertility, attract worms, retain moisture around plants, create new soil, and reduce weeds. This is a good project for the Autumn, Winter and early Spring seasons, when you are considering new beds within grassed areas of your garden. To make a No-Dig Bed first make sure that the grass is cut quite low, then apply overlapping sections of newspapers (not individual sheets of newspaper) into a shape that will eventually become the shape of your planting bed, and dampen the newspapers. Then apply layers of organic mulches. i.e. straw and manure, leaf compost, grass clippings, seaweed, pine needles, and the contents of your compost bin, on top of the sections of the newspaper. The newspaper and mulches block the sun from the grass, decomposing the grass underneath, attracting worms to the area, and eventually the mulches create a fertile soil medium in which you can directly plant – trees, soft fruit bushes, potatoes, globe artichokes, herb plants, pumpkins, or potted perennial flowers. In her book Creative Vegetable and Herb Gardening, Joy Larkcom offers a contemporary approach to companion planting, juxtaposing vegetables, herbs and wild plants within defined areas of front or back gardens. Her style is based on French potager or kitchen gardens (with inspiration from European walled monastic gardens), and their emphasis on culinary and healing herbs, planted in conjunction with vegetables, soft fruit and fruit trees. Essentially this method of gardening combines organic gardening practices and biodiversity gardening. The aim is to create diverse ‘scenes’ of dense and textured edible planting. This approach to gardening, conserves water (as areas between plants are not bare and dry) and reduces weeds by not offering spaces for them to grow. The complexity of this planting scheme mixes flowering herbs, soft fruit and fruit trees attracting pollination. This planting style also aims to confuse predators seeking out plants of the same type to infest. Another benefit of creative vegetable gardening is low maintenance, as plants tend to grow into each other, both reducing the growth of weeds and creating an attractive ‘edible landscape’. The photos are examples of this method. 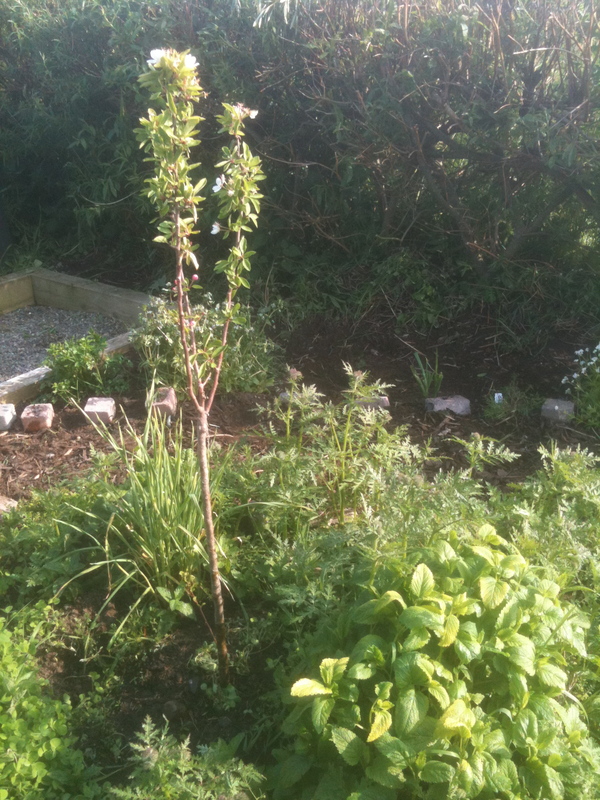 This kitchen garden area is growing – sweet woodruff, welsh onions, hyssop, borage, lemon balm, mint, potatoes, thyme, garlic, broad beans, oregano, spinach, tarragon, lamb’s ear lettuce, parsley, lavender, a crab apple tree and two types of green manure fertilising plants (crimson clover and phacelia). The rear of this planting area is supported by a ‘fedge’ a live willow fence which offers protection from wind. 1. Site an edible garden close to your kitchen or front door, to facilitate easy access and regular observation of pests, dry soil, and as a reminder to use your herbs and vegetables regularly. 2. Surround with structured boundaries if possible, i.e. an edible herbal hedge (rosemary, lavender, thyme), a series of raised beds, a native fruiting hedge surrounding the garden (elder, hazel, wild plums, wild roses, rowan, crabapples) or weave cut hazel or willow branches around fence posts. 3. Develop a series of narrow beds with paths in between. 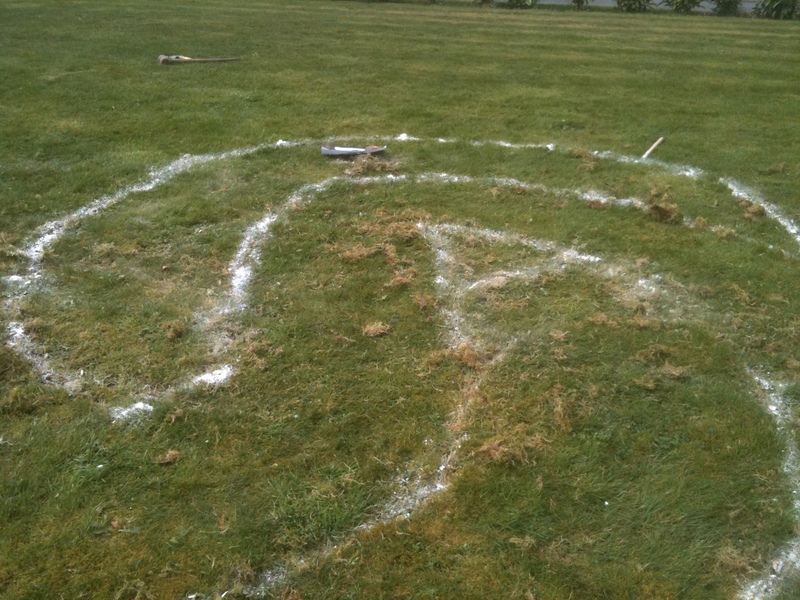 The paths can be made from grass the width of a lawnmower or wheelbarrow. Bark chips can also be used to separate planting areas. Create these planting areas, approximately one metre wide, so that you can reach across the growing area easily. 4. Plant vegetables, soft fruit, herbs, flowers and fruit trees with an eye for creating patterns and symmetry. 5. Incorporate height (i.e. globe artichokes, bean and pea wigwams, soft fruit bushes and fruit trees), to provide centre pieces for planting areas, while using vertical space as productive space within the kitchen garden. Niall MacCoitir’s book Irish Wild Plants: Myths, Legends and Folklore is an excellent reference to the folklore and cultural traditions associated with native plants in Ireland. MacCoitir offers an example of an Irish folklore tradition for May, with his description of the use of May Blossoms to protect the home and farm from influences which would impede a good harvest and livelihood. Two flowers associated with this tradition are the pale yellow Primrose and the Marsh Marigold. 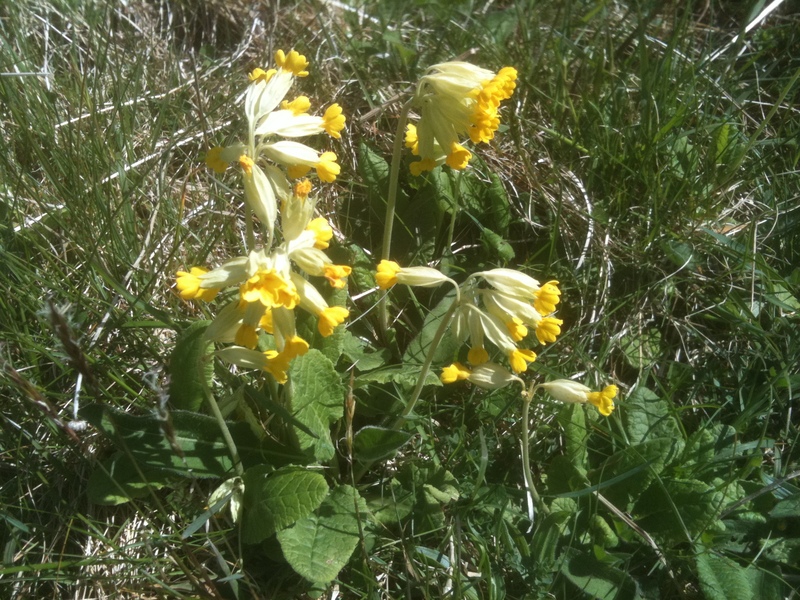 The Primrose and Marsh Marigold were symbols of vitality and strength, and on May Eve (April 30), they were gathered by children at dusk and hung in the house, over the door or laid upon windowsills. They were also strewn on the thresholds of the front and back doors of the home and around farm buildings. Nettles also had an association with May Day. In some areas of County Cork, May Eve was known a “Nettlemas Night”, according to MacCoitir, “Boys would parade the streets with large bunches of nettles, stinging their playmates. Girls would join in too, usually stinging the boys whom they held in affection. In west Galway the man of the house would go out on the night of May Eve and gather a handful of nettles. The nettles were pressed and everyone in the house would drink a mouthful of the juice to keep ‘a good fire’ in them for the rest of the year” (MacCoitir, Irish Wild Plants). “Emotionally we derive from nature pleasure, fulfillment, inspiration and solace; nature is fundamental to our culture, language, psychological and spiritual well-being” (ENFO Ireland, Environmental Information Service). In general these wild plants are cooked or seeped in hot water, and can be drunk warm (with honey) or used cold with fruit juices and fresh herbs such as Lemon Balm and Mint. Consult a herbalist for specific ailments, the following are general associations to wild plants taken from the book 20 000 Secrets of Tea by Victoria Zak. Elderflower differs in that it is soaked in spring water, sugar and wine vinegar strained through muslin and bottled – refer to the Recipe Section for more information. Flowers are rich in nectar and pollen for bees, butterflies and moths – nectar provides sugar and energy, while pollen offers proteins and fats. 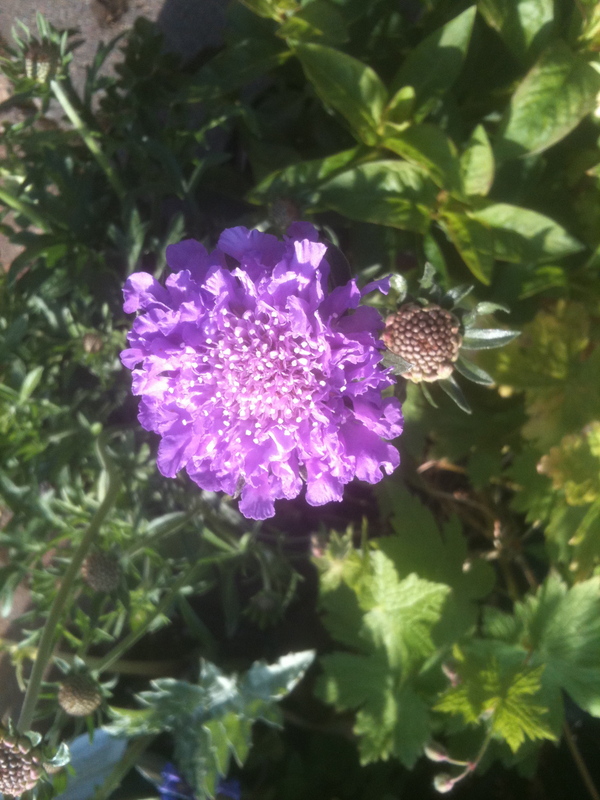 Native wild flowers and cottage garden perennial flowers offer sources of both pollen and nectar, and enrich ‘nature-scapes’ within home, community and school gardens. Ideally a range of flowers throughout the growing season – from early Spring to Autumn – offers a consistent offering of food. Attracting pollination of fruits and vegetables is secured with the provision of flowers from native wild flowers, herb flowers and decorative flowers, planted in close proximity to vegetable and fruiting garden areas. Ideally both are inter-mixed with perhaps edible flowers incorporated alongside vegetables. An Taisce, The National Trust for Ireland, estimates that the value of pollination to the Irish economy is 53 million Euros. Bees are currently threatened in Ireland, “the main threats to pollinating species include habitat destruction, agricultural intensification, and a lack of food and nesting sites. 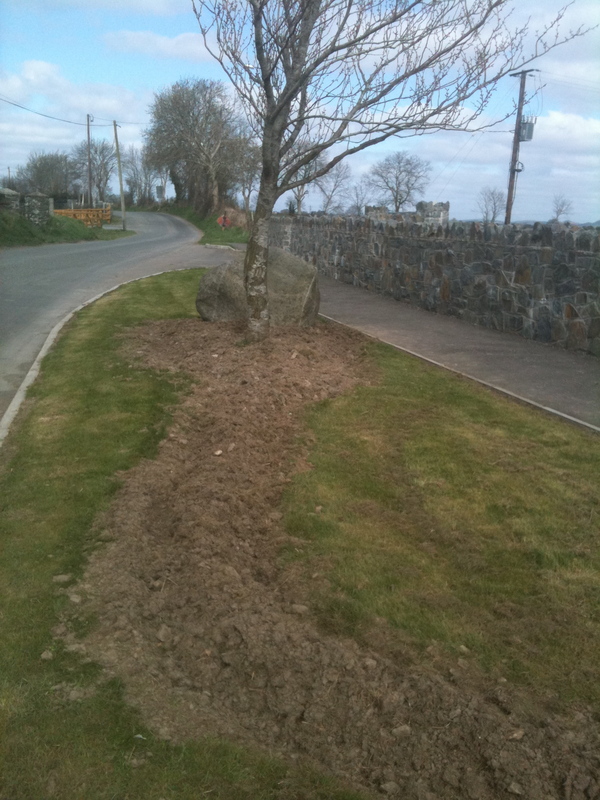 There are many simple measures that can be taken to help conserve our pollinating species such as planting plants attractive to bees in your garden, leaving areas of garden ‘wild’ to act as nesting sites, maintaining hedgerows and other semi-natural areas as forage and nesting areas” (www.antaisce.org). The design features of nature-friendly flower gardens are – dense planting, leaving no bare earth and encouraging self-seeding to produce drifts and textures of flowers. Try to avoid straight lines when cultivating new planting areas, and install curved and meandering areas of abundant growth. Place seating areas within an enclosure of flowers to observe bees, butterflies and moths. 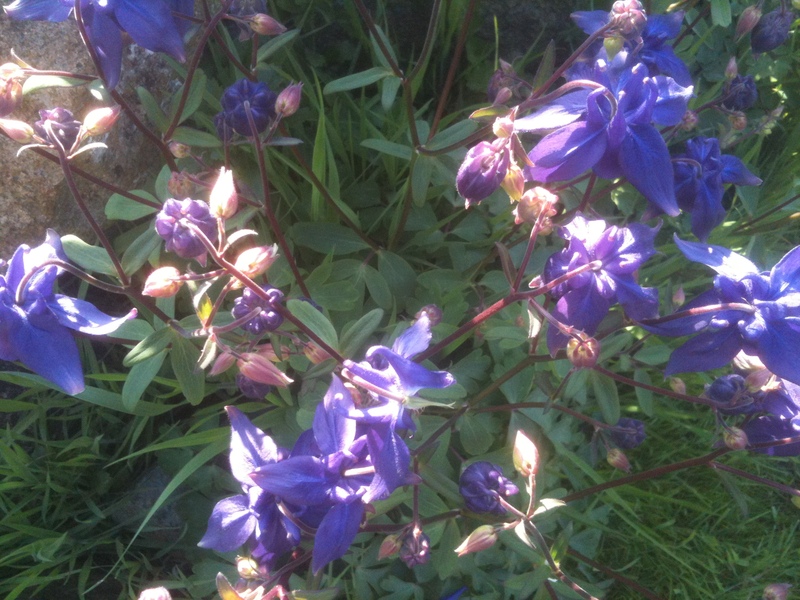 Lupin, Cornflower, Hyssop, Borage, Rudbeckia, Foxgloves, Yarrow, Cranesbill Geranium, Rosemary, Primroses, Heather, Columbine (Granny’s Bonnet, Aquilegia), Feverfew, Cat Mint (Nepeta), Sage, Lavender, Bugle, Field Scabious. Cowslip, Teasel, Purple Loosestrife, Ragged Robin, Marsh Marigold, Musk Mallow, Viper’s Bugloss, Great Mullein (Verbascum), Campion, Knapweed, Bird’s Foot Trefoil, Bluebell, Rose Burnet, Ox-Eye Daisy, Delphinium, Iris, Hollyhock, Honeysuckle, Campanula, Wallflowers, Stock, Lilacs, Forsythia, Buddleia, Fennel, St. John’s Wort, Hellebore, Snapdragon, Cardoon, Bergamot, Lady’s Mantle, etc. “Gardens make up a huge amount of our land mass and they provide food and shelter for a huge number of birds, butterflies, and other important wildlife. Growing native trees, shrubs and flowers or planting old-fashioned traditional garden plants from herbs to scented flowers provide more food and shelter than the newer hybrid and exotic breeds. 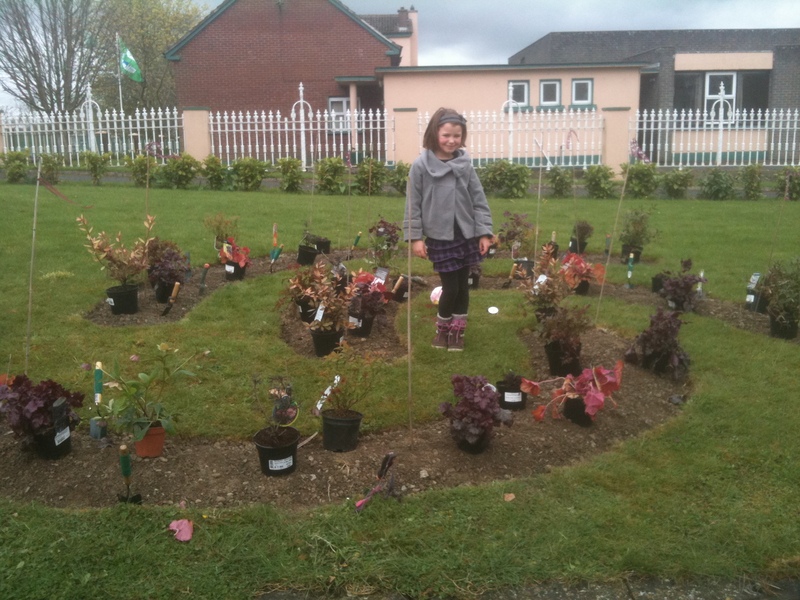 Everyone could play a part in planting native and traditional plants and using less peat, insecticides and other garden chemicals in their gardens and public spaces” (The Heritage Council of Ireland). Design by Nature www.wildflowers.ie For information on growing wildflowers and ordering seed. 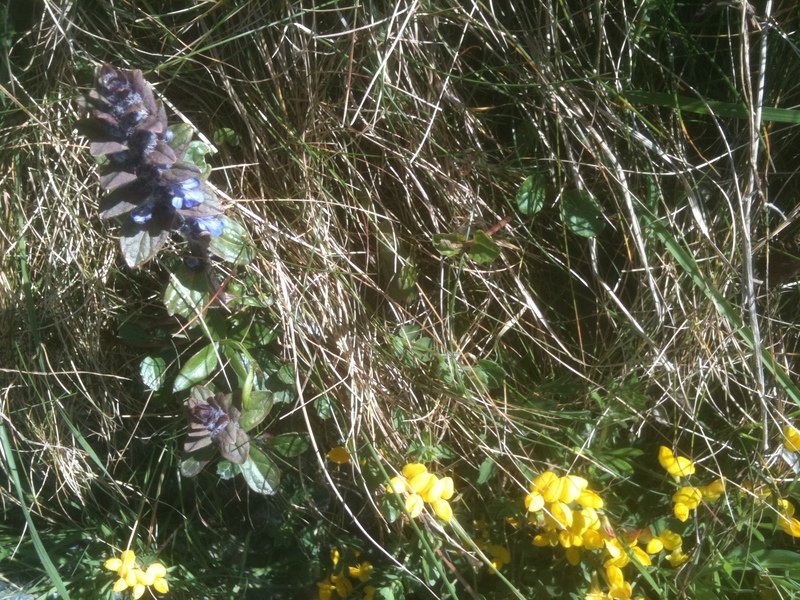 Irish Wildflowers http://www.irishwildflowers.ie To identify Irish wildflowers. Wildflowers of Ireland http://www.wildflowersofireland.net To identify Irish wildflowers. Peppermint Farm and Garden http://www.peppermintfarm.com To order small organic herbs and wild plants for delivery. 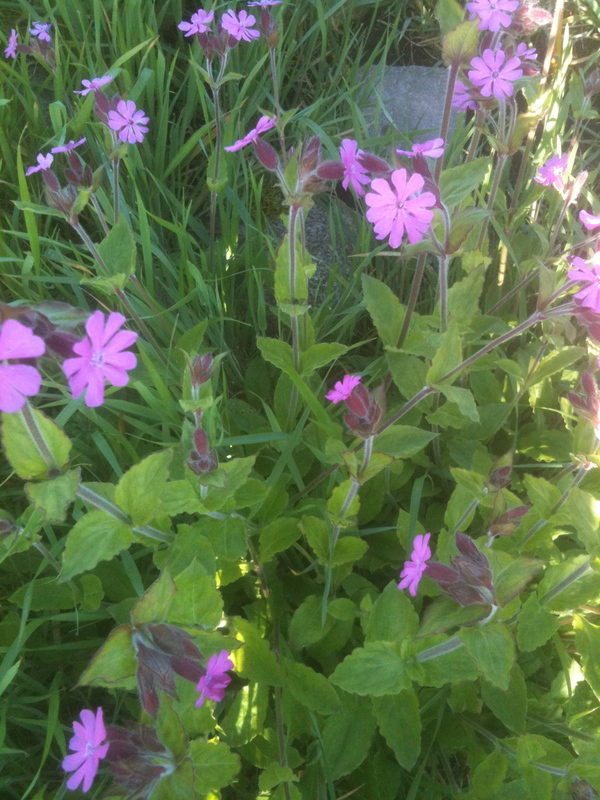 The Herb Garden http://www.theherbgarden.ie To order herbs, wild plants and seed. Photos: The top photo was taken in a new community garden area in Tallanstown, County Louth, and demonstrates the use of narrow beds to build dimensions within grassy areas. The next subsequent photos were taken in the Burren, County Clare and show purple Bugle and yellow Bird’s Foot Trefoil growing next to a laneway, while the last photo is taken in a meadow of cowslips. 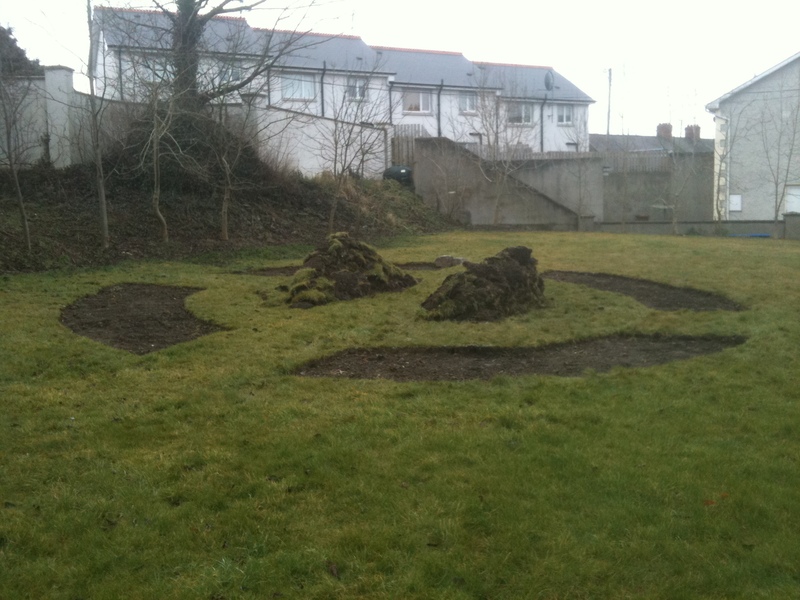 The pictures on the right were taken at the beginning stages of three community gardens located within the villages of Tallanstown, Louth and Kilkerley, County Louth, Ireland. The planning of all three gardens was based on a circular or curved theme. In each case all the planting areas are quite narrow. Each new garden area is a ‘landmark’ within grassy areas located near a church, village green and road verge. These gardens create a sense of ‘place’ within the larger village landscape. Although created for community planting days, each design could be translated into domestic gardens. The essential idea is to create a shape that is distinctive, and yet easy to maintain. Drawing on nature to cultivate new areas of growing that can be added to each year, to ultimately generate a variety of inter-connected planting areas. 1. Cultivate dense textured planting to retain moisture and reduce weeds. 2. Plant with a variety of plants that offer food for wildlife and people and contribute to the greater natural landscape. 3. Incorporate native trees, wild plants and wild flowers whenever possible. 3. Consider colour throughout the seasons, by way of flowers, bark and leaf tones. 4. Plant for bees, butterflies and birds – include plants with sources of nectar, pollen and berries. 5. Create micro-climates or sheltered areas by planting mixed fruiting native hedges, live willow fences, or create boundaries with dry stone walls or woven hazel fences. 6. Plant vegetables and herbs in the front of your garden near to your house, to be easily harvested and tended throughout the year. 7. Incorporate height with trees, shrubs, and tall wildflowers and underplant with perennial flowers/vegetables, soft fruit, wild plants or herbs.